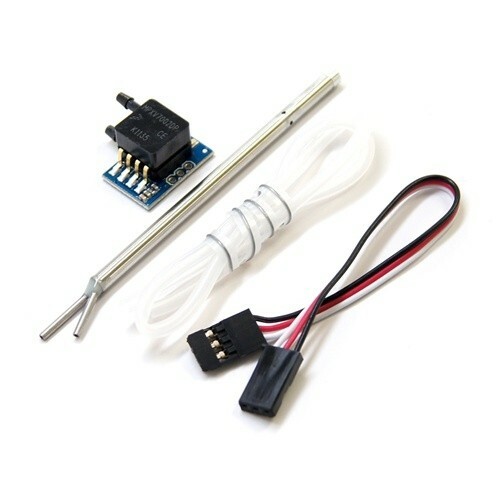 This is a stand-alone airspeed sensor kit which is used with the ArduPilot Mega 2.6 & Arupilot Mega 2.5. This kit Includes the Pitot Tube and a Servo Cable, the servo cable supplied is Female to female. To connect the airspeed sensor kit to the Oilpan IMU you will need 6 male header pins. If you need to order the male pin headers for the air speed sensor board and Oilpan, we stock the male pin headers in strips of 36 here. For the ArduPilot Mega 2.6 & Arupilot Mega 2.5 there is no need to install additional pin headers as these are supplied installed on the board for you to "plug & play"
Please Note: The kit is now shipping with the latest Combined Pitot Tube. Low pass filtered. Temperature Compensated over 10° to 60°C. Durable Thermoplastic (PPS) Package. 0 to 3.92 kPA. 1.0 to 4.9 V. Includes Pitot Tube & Servo Cable.